at my front door yesterday!!! Nic says, "Nana you have a package!" It was a box full of American Craft goodies that I had won earlier in the week. I entered a post on FB close to Valentines Day. And ended up being their winner. Go, me! Haven't had much $$ to spend on scrapbook goodies now we are on a limited income and my working has been pretty hit and miss lately. So this was greatly appreciated. Lots of yummy goodness from American Crafts, Dear Lizzy, Amy Tangerine, and Crate Paper. Some of my favourite designers. Look forward to playing with this in the near future. The mini stapler will go to Cait, since I already have a Tim Holtz one. And here we are at the end of another month. It is cold and has been snowing most of the morning. Now the sun is shining brightly, but won't really warm up until the end of next week. Just in time for my birthday! Hope everyone is enjoying a great weekend. Nothing new in my neck of the woods. Putting in the time while winter gets through with itself. But, I do see the days are getting longer. Thank goodness!!! It was a cold and sunny day here today. I went and got Big Hero 6 for the grandkids today. I promised them something since they both had good grades on their report cards. That is a challenge for Nic. No basket ball this evening. Only a practice. Her mum is off this evening and could take Harlee. But Curtis is off to camera club. He has a presentation on Pin Hole camera lens. So, I get to be home and create. Not to shabby!!! The first layout is from when Harlee and I went to the park. Decided to do just tone on toen and use up some of the large pile of Basic Grey I have. The title was cut with Quickutz Moxie font. This second layout is from baking sugar cookies at Christmas time. And some bling scattered throughout. It has snowed on and off most of the day. Not accumulated that much- only around an inch. But enough to cause trouble. One of my co-workers got hit out on the roads this morning. And it has turned cold. I think we had a high of around 19F. The last couple of weeks have been spoiling us. I didn't go out. I didn't go anywhere. I stayed in my hidey hole and created. Catching up on Christmas layouts. Catching up on my Dec. memory book. I also made some hot cross buns and sent half over to Kirsten's house. They won't last very long over there!!! And the countdown is on. Only 43days until we will be somewhere much warmer and listening to the palm trees sway and the ocean waves!!! Hope it is warmer in your little corner of the world! A couple of the layouts I made today. I cut the title on my Silhouette and misted it with Gold Color Shine. At this time of year you plan your outings. Just because it is nice where we are, that doesn't mean 90 mi. down the road you can say the same. Especially when you drive through the canyons and mountains. We headed south today, to Helena to make a Costco run. It has been quite a while since I was there. Like I think early Nov. It was a pretty nice drive, although we did hit some snow on our return trip driving through the canyon. So my freezer is once again filled up!!! Yesterday, I was cancelled from work and just on call. Until about 3:30 and then I went in while they admitted a baby. Our NICU has been very slow for Feb. after a busy Jan. Good thing I worked lot of hours then. I did 86hours in Jan. and thus far only 15hr for Feb.
Curtis ran Harlee all around to her activities yesterday afternoon and evening. And here she is froggy today. I told her not to share with her nana and papa. I had gone to pick up Nic yesterday morning as he wasn't feeling too well with a sore throat. Seems OK today! Layout I did of the Kids at the Christmas stroll last Dec.
Gee, Where did the Weekend Go??? Seems to have whizzed right by. Yesterday,was a day out of the house. I took Harlee to Girl Scout Thinking Day. Instead of driving across town to come home, I visited our friendly Walmart store. I needed groceries. And it wasn't too bad an adventure as Walmart goes. I think I actually got in before the rush. It had been snowing most of the morning and some of the roads were slick. And I think most people didn't venture out. I could hardly wait to get home and have a cup of tea. Today, I have managed to keep busy too. Did the wash. Changed the sheets. And I baked my first batch of hot cross buns. Uploaded our Alaska photos so I could get them printed and put them in the little album I created. Winter and the cold have returned. Not much snow, we need more, they say. But it is down right chilly out. A layout of H. making snow angels, earlier this winter. Most papers are from We R Memory Keeprs. I cut out the title on my Silhouette. And swim lessons from back in the summer. Last evening I went to Harlee's basketball game. When the games at 5:30 it makes for an interesting evening. Kirsten thought we should have dinner at my house since everything was on my side of town. Tim's work is just over the hill and he gets off work at 5pm. She went to pick him up, while I got the kids fed. And boy, did they eat up. Kirsten blew in with Tim and made them a couple of sandwiches. Curtis stayed at home with the boys and the rest of us headed out. H. is on the left with pink shorts. She is happy when they get a basket. She even got one. It is pretty intense for second graders!!! We are headed back to snow and cold this weekend, after some nice weather earlier this week. A reminder from back at the beginning of Dec.
Why I do this to myself, I'll never know!!! I have been saying my hallway needs to be painted. It is looking tired and has been forever since it was painted. And today was the day! I decided I would tackle it. I washed the walls all down this morning. I got my paint supplies out. I had paint I wanted to use from when I did my kitchen last spring. But I had to run to the hardware store for some painters tape and a roller not for smooth surfaces. After lunch I started painting. I got all the walls done and have to go around the doorways tomorrow. I thought I had cream walls before I started painting. But not once I got started. So painting took up my afternoon. Now I am sore and tired. A little layout of Nic from swim lessons last year. Papers from Fancy Pants and We R Memory Keepers. I cut the polaroid frame on my Silhouette. Embellishments from fancy Pants and Crate Paper. Yes, we celebrate Pancake Tuesday in this household. They were are our plate for dinner. I was out late in the afternoon for a staff meeting. Got my rig filled up with gas since the prices seem to be on the rise. The first picture in the first layout is the same one I did a couple a days ago. Just more my style. Have just enjoyed 2 hours of Stevie Wonder Music on the TV. Almost as good as being there in person. This is the music I grew up with! I lived 2 hours across the border from the Motor City!! How could one not get absorbed in the music of Motown!!! My day started out early. I was only on call for work, but did manage to go in for a couple of hours to cover for a staff meeting. Tomorrow I get to go to the meeting. Came home and got caught up on my ironing. My pile is much less these days since I am not having to do at least 5 dress shirts a week for my hubby. That is a nice break. After lunch I spent a little time with Kirsten and the grandkids. We visited Barnes and Noble and the pet store. Cooper was in awe of the critters and all the fish swimming around. Nic thinks he wants a fish! And spent a little time creating. Good day to be inside. After all abnormally warmer weather , today was cold and snowy. More like mid February. A little layout of Nic and his first ride on Papa's big motorcycle. He put armrests on last summer for when he take the grandkids out. He never knows if Harlee is still back there when he is out with him, as she is such a light weight. Gears cut on Silhouette and Memory Box dies. And that is OK with me. Curtis left for the afternoon, so this girl took a nap. When I actually sit and start to fall asleep, I know my body is calling to nap. So, I did!!! That is what happens when I don't sleep so well. Doesn't help when it is grey and dull out. 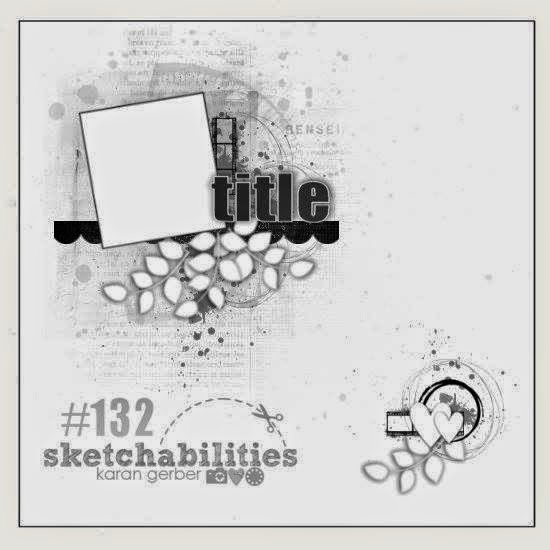 Sketchabilities has a new sketch up, which I tackled earlier today. I am sorry, but their sketches all look the same to me. The background doily and title were cut with Quickutz fonts. and Tim Holtz Distress Ink. Hope you have enjoyed an awesome Valentine weekend. Hope you have enjoyed a wonderful Valentine Day with the one you love. I know I did! Photo from our Alaskan cruise last summer. Was awake way too early this morning and could not go back to sleep, so I am super sleepy this evening. Had a quick trip up to work to fill out my self assessment. It is that nagging time of year. Needed to be done by tomorrow. We had the boys here for a couple of hours, while their mum did some repair work in their bedroom. Nic is moving out of the car bed to a lofted bed. I didn't think he would ever give up his car bed. Cooper will move into it and Kirsten is taking the crib down. And worked on a couple of layouts. Had our romantic dinner at home. More than delicious and half the price. Steak and bake potato and a salad. Nice bottle of Riesling wine with it. Now being a couch potato. Embellishments from Fancy Pants, Crate Paper. And all is well. Has been a busy, busy day. I was out of the house before 7am to deliver my heart cookies for the bake sell. And according to a coworker they were gone before she got there a little after 8am. Crazy!!! Need to make them more ahead next year and freeze them without icing and then ice the week of the bake sale. I hit the grocery store while I was out. So, much crap for Valentine's Day. Ridiculous!!! I came home and vacuumed and dusted and mopped floors. I made cookie dough and cut out more hearts and iced them all. Just because my grandson asked me to. I am sure they will be gone lickity split at her house. Curtis is on a Red Cross Blood Drive to Missoula. He and his buddy left earlier than usual, so I hope he is home in good time this evening. No more midnight or later. Beautiful, beautiful day out. Nearly 60F. So untypical for February. But I am loving it. And the days are longer, which makes me happy. Kirsten and the kids were just here. And enjoyed their little visit. Gave the kids their Valentine's goodies. And Cait has made a decision about a job and will be employed likely by the end of the month. A couple of layouts with Mr. Cooper. As Valentine's Day is almost here! Hope you have been enjoying them! They were very fun to make. Hope Cait gets her goodie box soon. All my cards were pretty sparkly and glittery this year! Spent the morning at Kirsten's helping her go through the kids clothes. And move smaller sizes out of their cupboards. Sometimes it can be an overwhelming task with three kids. Getting piles ready for a garage sale later this year. Did a little scrapping this afternoon and then the chauffeuring commenced. Kirsten's family is down to one car currently. She needs her clutch replaced and a couple of other things. Parts have been bought and Tim plans to work on it this weekend. So, we have been taking Kirsten home in the evening so Tim doesn't have to rustle the kids out of bed to get her. Harlee had a basketball game on the other side of town at 5:30. We picked up Tim after work at 5 and headed to Kirsten's. And now Curtis is at camera club. A jam packed afternoon. And Cait is still in turmoil over which job she wants to accept. Don't ask her to make a choice! She is a true Gemini! Have had a couple of busy days! I thought life was suppose to slow down as you got older. So, not true!!! Yesterday I was out the door early for some education at the hospital. Left there and went to PT. Came home and iced up 4 doz. Valentine cookies. Still had a few todo today. And Nic thinks I should bake him more for Valentine's day. I feel I have done my share of baking for the bake sale. Went out for dinner last evening with some friends. Today, I have had Cooper here to watch. Somewhere in there I managed to clean my bathrooms. Have been on a baking blitz the last couple of days. I wanted to send a goodie box out to Cait with Valentine cookies. And everything just blossomed from there. The March of Dimes has an annual bake sale the Friday before Valentine's Day. So an old co- worker was after me to do some baking for them. Another co- worker was after me. I told her I would make 2 doz. sugar cookies for a donation to MOD. I was cancelled from work this morning, but they needed me around 2pm this afternoon. So I thought I had take some samples into work. I noticed they were all gone when I left. I got told mine were as good as a local bakery in town! Pretty nice compliment! It's getting closer to the big love bug day! Cooper is so cute these days! And I want to box up all his cuteness, so I can remember a year down the road! He us actually trying to communicate and say words I can understand, instead of just martian all the time! I took these photos a couple of weeks ago, and had to share them! Hey, nana! Look what papa left sitting around for me. It has lots of buttons and knobs! Do you think he would let me take it home? Maybe I should fix it first with this plastic knife! His sister giving me the stink eye! A Bluesy Kind of Day!!! Doesn't take much the last couple of days for the tears to be flowing! The weather is grey and dull outside. I went to work to catch up on mandatory education. Made up the bed Cait had been in and changed our sheets too. Curtis did a Red Cross blood run to Missoula. That meant I had to pick him up at 11pm last night. At least that was earlier than the last couple of runs he has done. Picked Toots up from school and took her to the Girl Scout Cookie Rally. Wish they had told me the right time, though. They told me from 6-7, and it was from 7-8. At least I had a really close park, We just stayed there, as I didn't want to drive all the way across town and back again. So, getting the laundry done. Spending time in my scrap space. A Layout to share with you. Yesterday, was a sad day for this mama! We had to take Caitlin back to Shelby to catch the train home to Seattle. Toots wanted to go with us when we picked her up from school! She gets out early on Wed afternoon. I packed up some food for Cait to enjoy on her ride. It was a terrific, though short visit. And I will take what I can get. I got cancelled from work for most of the day on Tuesday, so I could take in my fill of Caitlin. It was a pretty drive home as the sun was setting. Nice the days are a little longer now. The clouds and the mountains were merging on the western horizon. Not colourful, just pretty with the clouds! We have also moved into this century and got rid of our land line phone and cable! It was almost $100/ month for these two things and when one is one a limited income you look for ways to cut back. It is not like we were really using the cable. We only watched about 10 stations of what they offer. And it is not like we will be going without. We have availability to watch Netflicks and Amazon Prime. And will investigate streaming with ROKU. Any words of wisdom on this? And the best news was she got a job offer after we dropped her at the train station! Praise be!!! She has to hear from one more interview! Just a little layout of Toots and papa. Papers from Glitz Design and Fancy Pants. The doily and heart were cut out and misted with color shine. Title cut with QuicKutz Sunshine font! 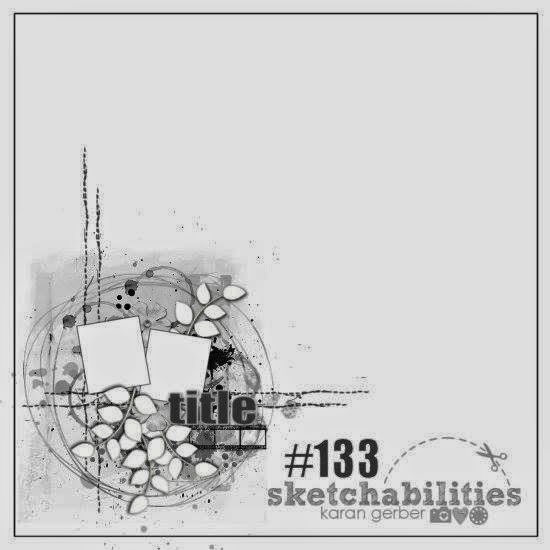 Sketchabilities has a new sketch up! And I decided to play along. I am cancelled from work today and just on call, so I can stay at home and play. Enjoying Cait's last full day here. And here is what I did! I chose this background paper as it has chalkboard elements along the right side. I was trying out mists I thought I wanted to put on the page, but instead cut out the leaves from the end result. I stamped cup rings on the paper instead.